Have you ever felt a little mbuki-mvuki – the irresistible urge to “shuck off your clothes as you dance”? Perhaps a little kilig – the jittery fluttering feeling as you talk to someone you fancy? How about uitwaaien – which encapsulates the revitalising effects of taking a walk in the wind? 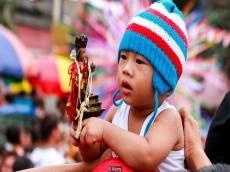 These words – taken from Bantu, Tagalog, and Dutch – have no direct English equivalent, but they represent very precise emotional experiences that are neglected in our language. And if Tim Lomas at the University of East London has his way, they might soon become much more familiar. Lomas’s Positive Lexicography Project aims to capture the many flavours of good feelings (some of which are distinctly bittersweet) found across the world, in the hope that we might start to incorporate them all into our daily lives. We have already borrowed many emotion words from other languages, after all – think “frisson”, from French, or “schadenfreude”, from German – but there are many more that have not yet wormed their way into our vocabulary. Lomas has found hundreds of these "untranslatable" experiences so far – and he’s only just begun. Gigil is a Tagalog word that describes the irresistible urge to pinch or squeeze someone because they are loved or cherished (Credit: Alamy). Lomas says he was first inspired after hearing a talk on the Finnish concept of sisu, which is a sort of “extraordinary determination in the face of adversity”. According to Finnish speakers, the English ideas of “grit”, “perseverance” or “resilience” do not come close to describing the inner strength encapsulated in their native term. It was "untranslatable" in the sense that there was no direct or easy equivalent encoded within the English vocabulary that could capture that deep resonance. Intrigued, he began to hunt for further examples, scouring the academic literature and asking every foreign acquaintance for their own suggestions. The first results of this project were published in the Journal of Positive Psychology last year. You can view many more examples on his website, where there is also the opportunity to submit your own. Lomas readily admits that many of the descriptions he has offered so far are only an approximation of the term's true meaning. "The whole project is a work in progress, and I’m continually aiming to refine the definitions of the words in the list," he says. "I definitely welcome people’s feedback and suggestions in that regard." In the future, Lomas hopes that other psychologists may begin to explore the causes and consequences of these experiences – to extend our understanding of emotion beyond the English concepts that have dominated research so far. But studying these terms will not just be of scientific interest; Lomas suspects that familiarising ourselves with the words might actually change the way we feel ourselves, by drawing our attention to fleeting sensations we had long ignored. As evidence, Lomas points to the work of Lisa Feldman Barrett at Northeastern University, who has shown that our abilities to identify and label our emotions can have far-reaching effects. Her research was inspired by the observation that certain people use different emotion words interchangeably, while others are highly precise in their descriptions. This is called “emotion granularity” and she usually measures this by asking the participants to rate their feelings on each day over the period of a few weeks, before she calculates the variation and nuances within their reports: whether the same old terms always coincide, for instance. Wabi-sabi is a Japanese term that describes our appreciation of transient and imperfect beauty - such as the fleeting splendour of cherry blossom (Credit: Getty Images). Importantly, she has found that this then determines how well we cope with life. If you are better able to pin down whether you are feeling despair or anxiety, for instance, you might be better able to decide how to remedy those feelings: whether to talk to a friend, or watch a funny film. Or being able to identify your hope in the face of disappointment might help you to look for new solutions to your problem. In this way, emotion vocabulary is a bit like a directory, allowing you to call up a greater number of strategies to cope with life. Sure enough, people who score highly on emotion granularity are better able to recover more quickly from stress and are less likely to drink alcohol as a way of recovering from bad news. It can even improve your academic success. Marc Brackett at Yale University has found that teaching 10 and 11-year-old children a richer emotional vocabulary improved their end-of-year grades, and promoted better behaviour in the classroom. “The more granular our experience of emotion is, the more capable we are to make sense of our inner lives,” he says. Both Brackett and Barrett agree that Lomas’s “positive lexicography” could be a good prompt to start identifying the subtler contours of our emotional landscape. “I think it is useful – you can think of the words and the concepts they are associated with as tools for living,” says Barrett. They might even inspire us to try new experiences, or appreciate old ones in a new light.